Many businesses in town are doing specials related to the upcoming Steelers SuperBowl. 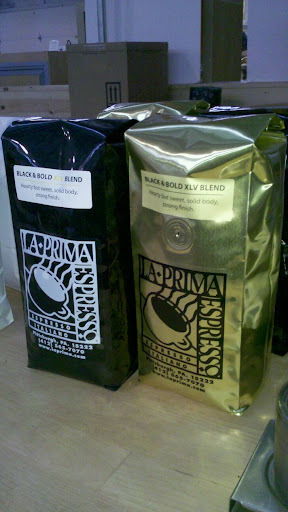 La Prima has packaged a special Black N Bold XLV coffee which has me wishing the SuperBowl season never ends. As titled, the coffee is very bold and dark, but extremely smooth. I had La Prima has a stand at the Pittsburgh Public Market (@PghPubMarket on Twitter). The very kind worker was happy to grind the rich beans for at home brewing. I am sure to return and get more of this blend before the big day on Sunday. This is not the first time I’ve caught La Prima turning heads. I’ve been asked to ship La Prima coffee to co-workers in DC after they experienced the premiere coffee at Simpatico Espresso downtown.